So this is the first of a few items devoted to the content at chumpville.com. Let me say at the outset I hold no ill will toward the author. He has some obvious conceptual errors on the site, and I am providing information that addresses these errors. As it stands, the thesis presented on chumpville.com has three main points. 1. 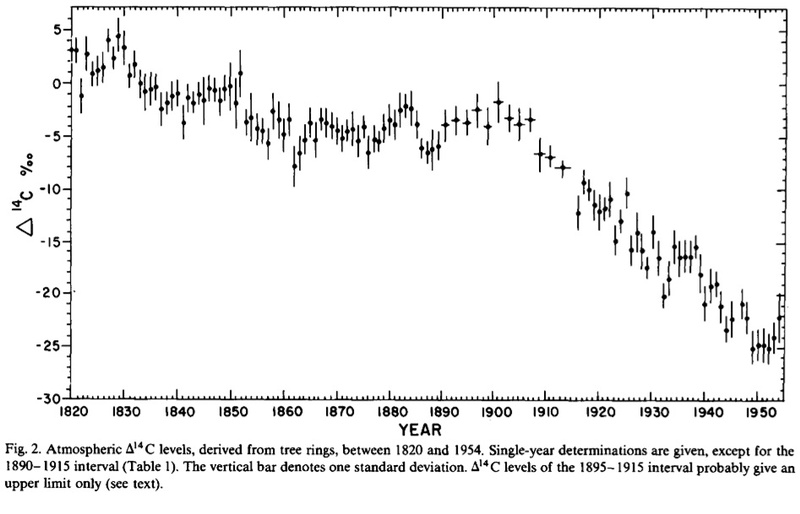 That atmospheric water vapor rose in the 1970s, and this increase is the cause of observed climatic warming continuing to present. 2. The cause of the increased water vapor is increased solar activity, resulting in increased insolation and incoming shortwave radiation to the Earth's surface. 3. 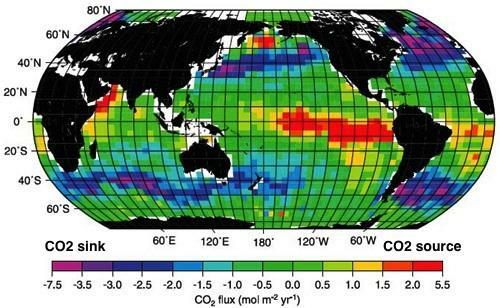 One result of the warming is warming ocean surface waters, which causes the increasing atmospheric CO2 concentrations currently observed. I'm going to address these in reverse order, because the third claim is the simplest to show as erroneous. 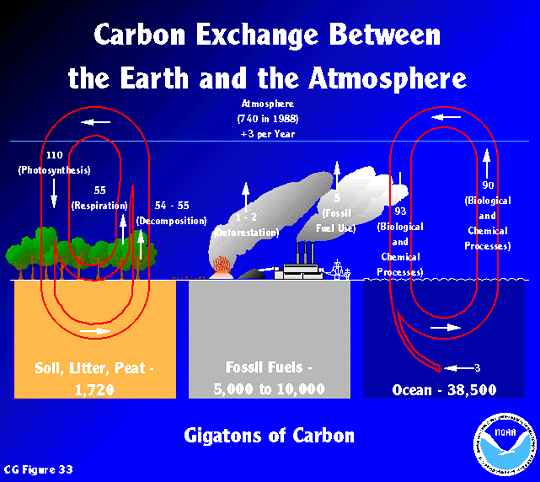 There are several ways to show that the CO2 increase in the atmosphere is due to human activities, primarily the burning of fossil fuels for energy production. I'm going to list just a few which I think are interconnectedly supporting; there are more. I expect to find a couple of Web sites that also show this and add them as links below. 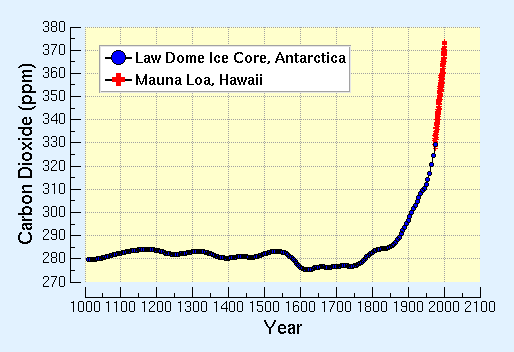 Point 1: The CO2 increase, as measured in samples of the atmosphere trapped in ice cores, begins in the mid-1800s, at the same time that the pace of industrialization (and consequently the burning of oil and coal) rapidly intensified. 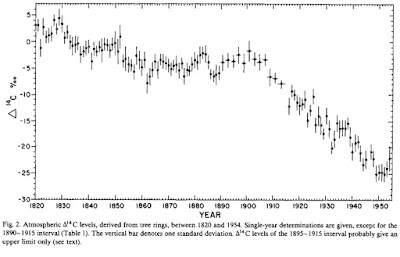 There was no significant warming during the mid-1800s, and in fact the era was cool. 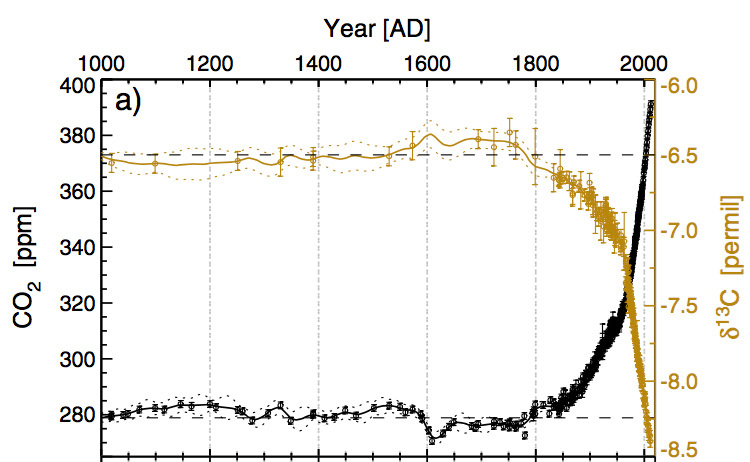 This was due to the tail end of the Little Ice Age, as well as a couple of major eruptions (Tambora and Krakatoa). For the latter, the effects probably only lasted a decade at most, with effects fading with further time elapsed from the event. But still, they did help keep things cool. The summation of these measurements is that the oceans are absorbing more CO2 from the atmosphere than they are releasing. Warm waters release CO2, cold waters absorb CO2. This is also tied in within upwelling along the Pacific Equatorial Upwelling Zone, and downwelling and deepwater formation in both the North Atlantic and in the Southern Ocean. Thus, the oceans are a sink and not a source for atmospheric CO2. Ironically, were mankind not involved, this would mean a very slow reduction in atmospheric CO2 concentrations, eventually resulting in cooler climate conditions. Conditions have to be very special for continental glaciations, so this wouldn't necessarily be the outcome, but still, the world would be cooling off a little. Concomitant with the absorption of atmospheric CO2 is the consequence of decreasing global ocean pH and desaturation with respect to calcium carbonate (CaCO3). Point 3: Without mankind, the world's carbon cycle would be approximately in balance. I posted this on Twitter, but it's worth looking at again. There are quite a few others, all with basically the same numbers. If you do the math (and if you want to check the numbers, feel free to dig into the literature), the reason atmospheric CO2 concentrations are increasing is the human contribution. Otherwise they'd be decreasing. The natural fluxes are much bigger, but they're nearly balanced. This has been used many times, but it's as if you had a big bathtub, with the drain open and the faucet on full, such that the level of the water in the tub isn't changing. If you then added water a tablespoon at a time from the sink, the water level would increase, even though the addition by tablespoons is much, much less than the input from the tub faucet and the outgo down the drain. Point 4: Given all that, is there definitive evidence showing that the CO2 in the atmosphere is increasing due to fossil fuel burning? Yes, there sure is. It's called the Suess effect. It's not named after the Dr. Suess that wrote those great kid's books, it's named after Hans Suess. "The Suess effect is a change in the ratio of the atmospheric concentrations of heavy isotopes of carbon (13C and 14C) by the admixture of large amounts of fossil-fuel derived CO2, which is depleted in 13CO2 and contains no 14CO2." Can it be measured? Yes, by looking at carbon isotope ratios in living matter and the atmosphere. Both 14C and 13C can be examined. 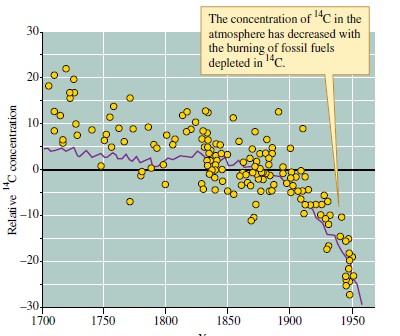 Note how in all of these plots, the values start to change in the mid-1800s, at the same time as rapid industrialization and markedly increased fossil fuel consumption. And to top it off, I just saw this plot. It's the best illustration of the Suess effect I've ever seen. 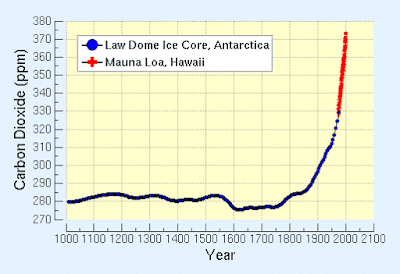 The data are again from bubbles in ice cores from the Antarctic ice cap. So, the CO2 is from human activities. It's not from the warming surface waters of the oceans. 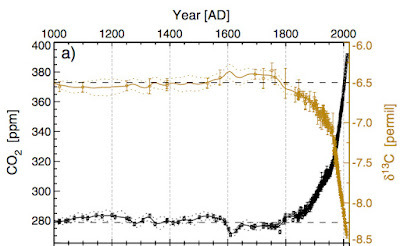 How do we know the CO2 increase is caused by human activities?